"Eat your greens!" We've all heard our mothers say that to us. Well, I can't think of anything much greener than Indian Saag. Couple that with chicken thighs being on sale this week at one of our local groceries. By on sale I mean what would normally cost you $8-9 now costs $3.50. That’s a sale I can get behind. Now add in that we’re growing spinach in our back yard that is in need of picking. You have the basics for an interesting meal. According to the “when life gives you lemons” philosophy, since life gave me chicken and spinach I had to find a tasty way to use them. Since I am the self-proclaimed "master of one dish" meals I went looking for something to fit that particular bill. My idea came from a local restaurant. Fry the chicken until golden browned. Recently we had a gift certificate to the Taj Mahal Restaurant in Halifax. One of our dishes was a lamb saag that was fantastic. 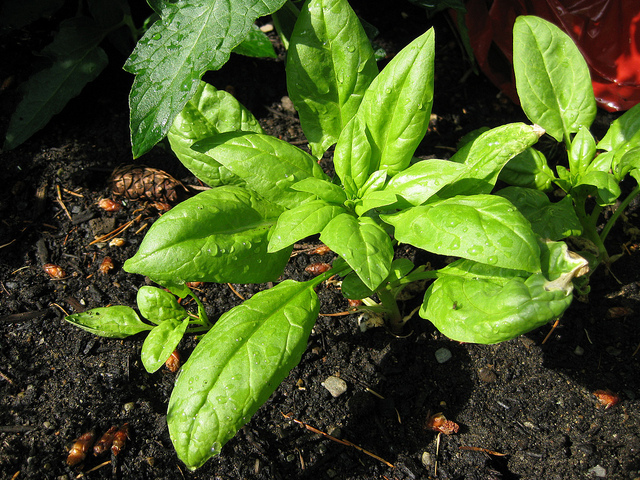 Saag, if you don’t know, is a spiced dish that is composed mostly of spinach. It’s a great way to get a lot of greens into a meal. By the way, the Taj Mahal deserves a post on its own. It’s a fantastic Indian restaurant. If you get a chance to go order the onion fritters appetizer. If you don’t, and see someone else get them, you’ll regret it. Saag, a common Indian dish, can be made with any meat. Most usually it is chicken, beef, goat or lamb. But that's not all that can be used. To make a truly vegetarian version, brown paneer (or firm tofu )in some oil and use in place of the chicken. 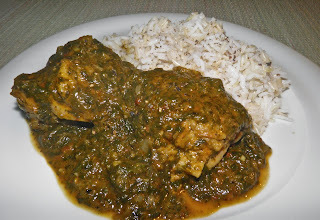 Even firm white fish is sometimes used in saag. The fish is added to the saag in the last few minutes of cooking. Some vegetarians eat fish, others do not, so I thought I would outline the option. Saag is most usually served with basmati rice. To make a slightly more interesting version, add a few cardamom pods to the water. They will impart their fragrance into the finished rice. Make sure you remove them before serving, although some people (like me) like to bite into the pods to get a burst of flavour. 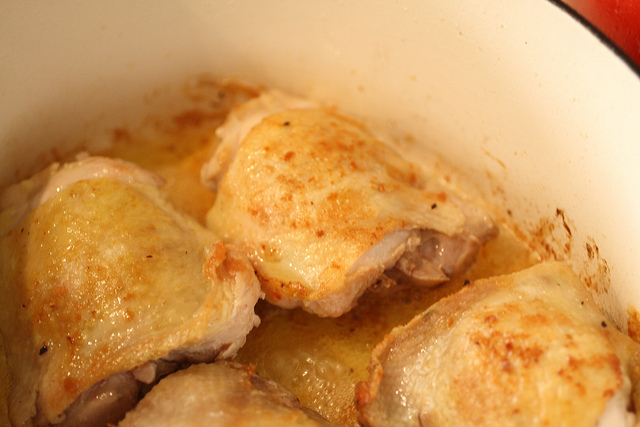 Heat a large skillet or sauce pan and fry the chicken on both sides until browned. (I find frying skin side up works best as the fat renders down into the pan faster.) Remove the chicken and leave any collected fat in the pan. Rinse the spinach, drain and add to the fat in the pan. Stir until it begins to wilt. Then add in the onion, ginger and garlic and cook until the onion begins to soften, about 5 minutes. Add the chopped tomato and milk to the pan. Purée the mixture with an emulsion blender. Then stir in the spices, sugar, salt and pepper. Turn the heat to medium high and cook for about 3 minutes. Taste for seasonings and adjust any as desired. This is your cooking sauce, so the taste has to be what you want for your final flavour. Then add the chicken back into the pan and nestle it down into the saag. Cover the pan (with cover slightly ajar), reduce heat to low and simmer for 30 minutes. Check often (and stir) to ensure the saag doesn’t stick to the bottom of the pan. The saag with be fairly thick. If it gets too thick add a little water or milk. 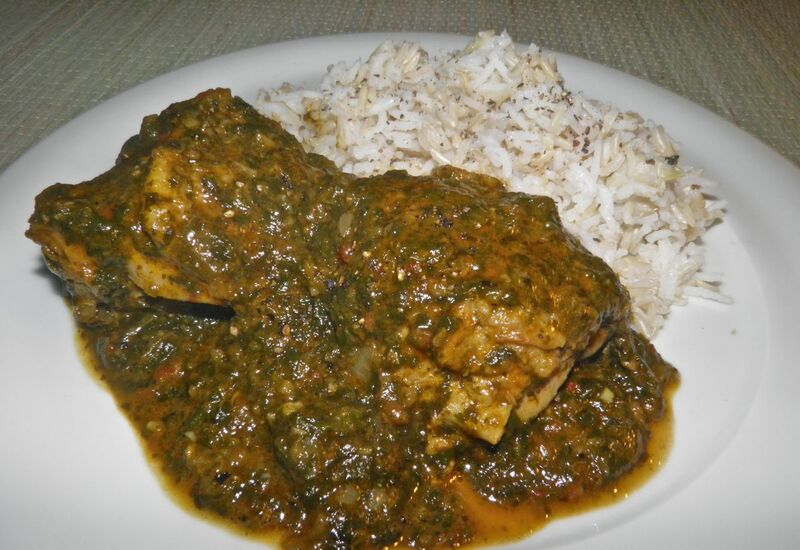 I tried your chicken Saag recipe and it turned out very good.